Clients come from multiple socio-economic levels and cultures. Many are from broken homes that lack parental/family structure with generational alcoholism, drug addiction, and psychological, physical, and/or sexual abuse. As a result, a high percentage are living a life of addiction themselves. The Center, located in Berlin, Maryland near Ocean City, offers all of its services and programs free of charge. While Grace Center employs paid staff, it relies heavily on volunteers to serve its clients in the community. Financial support for operations and outreach programs comes from fund raising as well as donations from the public, local businesses, and churches. In addition, grants from organizations like Qlarant play a large role in providing services and program development. 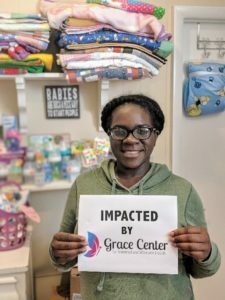 Through these funds, Grace Center is able to provide services such as hospital grade hCG pregnancy tests, post-partum home visits, and limited ultrasound exams. Grace Center’s programs are the long-term support that seem to be mentioned most by the mothers who have been helped by the organization. Their L.E.A.P. program (Learning, Empowering, Affirming, and Progressing) offers outreach, teaching, and mentoring to help pregnant or post-partum mothers. These women are able to schedule classes allowing them to take part in nearly 40 individualized classes, each designed to guide them through a healthy pregnancy, parenting skills, infant care, labor and delivery, breastfeeding, and other pregnancy related subjects. Following delivery, classes continue to address relationships, effective discipline, and healthy boundaries. The L.E.A.P. program even offers clients the opportunity to earn “points” for attending prenatal classes, OB appointments, support groups, dental appointments or psychological counseling. These points can then be used to “purchase” essential baby supplies in the Center’s on-site Baby Boutique. Gracie’s Baby Boutique was designed for new moms/dads to earn new items such as baby clothes, car seats, pack & plays, diapers, and other maternity/baby items. Project H.O.P.E. (Holistic Opportunities for Prevention and Education) addresses the current gap in services offered to high-risk pregnant women on the Lower Eastern Shore. Holistic healing is characterized by the treatment of the whole person, taking into account the mind, body and spirit as well as environmental and social factors. 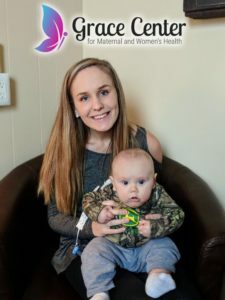 The program provided through a grant by Qlarant, targets poverty-stricken and ill-informed women facing pre-partum or postpartum depression as well as addiction. Many mothers have been positively impacted by Grace Center. Here are three of their Success Stories. When I originally came here, it was just to confirm my positive result on my home pregnancy test. These ladies are very sweet and loving. They really reassured me that I would be okay as a single mother. Every time that I come here, I feel welcomed and not judged regardless of my situation. Keyonna’s story touches on the unfortunate truth that support for young mothers doesn’t always come from their families. Grace Center provides a place where those that feel alone can find kindness and help during their pregnancies and after. Even young women who do have family support often experience fear when they discover that they are pregnant. Our next Success Story, Jane, shows that having a place to come for help with pregnancy like Grace Center is valuable for any one. Even when your mother works there! Hi, my name is Jane. I have a 5 month old and when I found out that I was pregnant at 19 I was scared and didn’t know where I could turn. My mom is Jackie who is also the Nurse Manager at Grace Center. I was nervous to tell her, as any teenager would be, because I didn’t know what she would say or how she would react. When I went to the Center, they did nothing but open their arms and make me feel so warm and welcome during such a nervous situation. I had no idea how my life was about to change, I just knew it would. 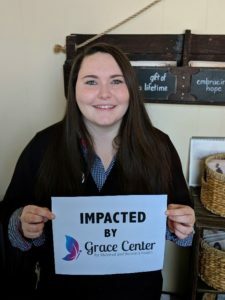 Grace Center’s support has made a tangible difference in this young woman’s life. Jane’s postpartum depression is a reality for approximately 15% of mothers. Including our third Success Story. I visited Grace Center unannounced without an appointment, in the spring of 2017. I cannot put into words what that did. As I’ve said before in further statements, Grace Center is a place where hugs are welcome, and support is given selflessly. I received talks of the future, of change and of an aspiring life that my endeavors would hold. I attended parenting classes with my significant other and we learned what really awaited us in the time to come. In January of 2018, I gave birth to my son Fineggan Daniel Bozman. Even though my own mother is deceased, I still felt ready and excited to conquer the challenges of motherhood. Before I had the Earth under my feet, but I fell in postpartum depression, something I sure was not ready for. Lost again, I went to the only place where wrongs were not cast against you and the only goal was happiness outside of one’s personal being. There, at Grace Center, I found myself surrounded with love, uplifting confidence, but most importantly the uttermost feeling of being home. I still to this day attend the postpartum depression Mothers Circle, a group of younger mothers that feel the same as I do. Leading and loving one another to the best version of ourselves. I also received care under both psychologist and psychiatrist both affiliated and given to me through federal grants. These three women are only a few of the dozens of who have been helped by the programs and services at Grace Center for Maternal and Women’s Health. I encourage you to visit their website and learn more about this organization. Through their work, the underserved women of the Eastern Shore of Maryland now have help and resources that until recently did not exist. Since 2008, Glennda Moragne El has been the Program Coordinator for Qlarant Foundation, the mission arm of Qlarant. 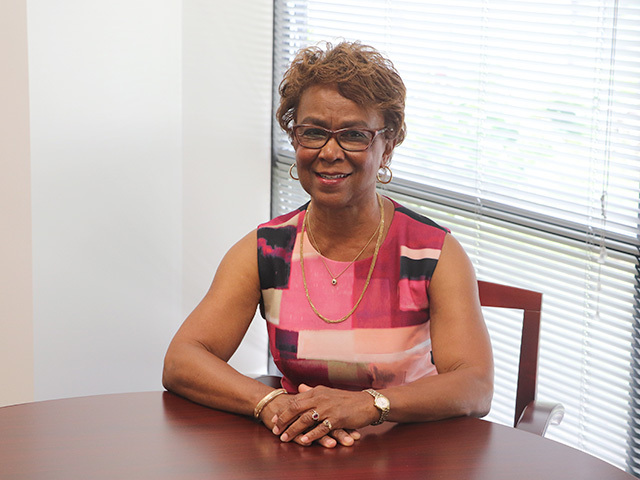 In her role, Glennda works with Qlarant Foundation’s Board of Directors to identify organizations that are doing remarkable work to improve healthcare and related social conditions in their communities. 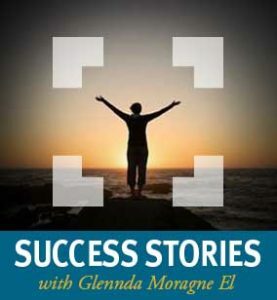 See all posts from Glennda Moragne El. If you have been to see a doctor lately you’ve most likely been handed a sheet of paper (or several) at the end of your appointment. Do you take the time to review this document or do you just toss it aside? Welcome to Code Words. I’m Cindy Jones, CPC, CPMA, CPC-I, a Coding Specialist here at Health Integrity. Each month I’ll be bringing you my thoughts on aspects of medical coding ranging from consumer basics to nitty-gritty CPC certification knowledge. We’ll cover ICD-10 guidelines, fraudulent billing, new procedure codes, and a lot more. There’s a Code for That! With the implementation of ICD-10 in October 2015, the number of potential diagnosis codes expanded from 13,000 to 68,000. One category of codes that received an extensive overhaul was the external cause codes. I began my career working for a small-town family practitioner. He was rebuilding his private practice after spending many years working in a trauma center. Initially, I was his only employee and responsible for many aspects of the practice – running the front desk, rooming patients and assisting with procedures. How can Qlarant help you improve quality and program performance?